Not a great WiFi connection for my last travel day. The MAC Blog "Hustle Belt" ranks the league's defensive lines. This year's OOC opponent Indiana has released a depth chart. Penn State loses its first transfer. The Boston Herald has a story on the Pat's walking wounded in 2011 and James Ihedigbo talks about his shoulder surgery and more. Mark Sanchez says the Jets RB's are doing well including John Griffin. A Bleacher report writer says Griffin has turned heads. 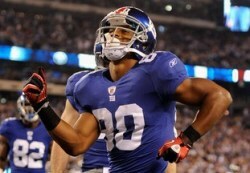 NJ.com said Victor Cruz put on a show for fans at the Giants practice. 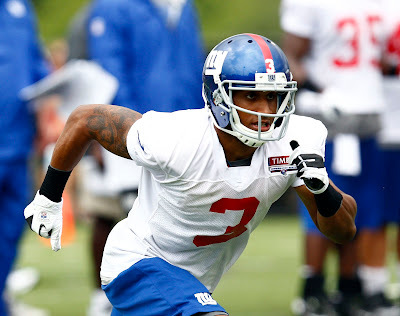 ESPN says the G-Men are still open to a contract extension for Cruz. Eli Manning feels fortunate to have Cruz as one of his WR's. 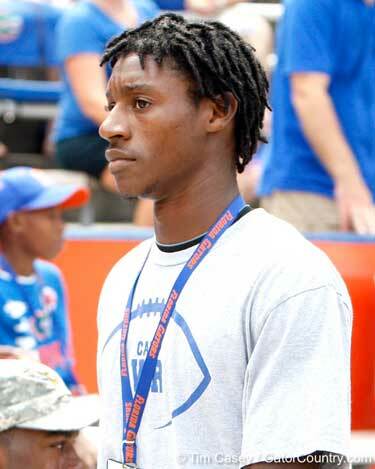 Gainsville WR Chris Thompson verbaled to Florida yesterday. CBS Sports has Nick Speller on their preseason All-MAC team. Perry McIntyre also gets a mention. The Morning Call discusses Penn State's upcoming schedule and says the Nittany Lions may have to add some "glamor" games to compensate for the bowl ban. Would they consider buying out the 2014 UMass game? If so, I hope McCutcheon drives a hard bargain. The MAC Blog "Hustle Belt" picks Brandon Levingood as the #5 MAC kicker going into the 2012 season. Emil Igwenagu is getting a look by the Eagles at TE as well as H-back. Emil gets training camp mentions here and here. The NY Post features Julian Talley in this training camp article. Julian gets another training camp mention here. 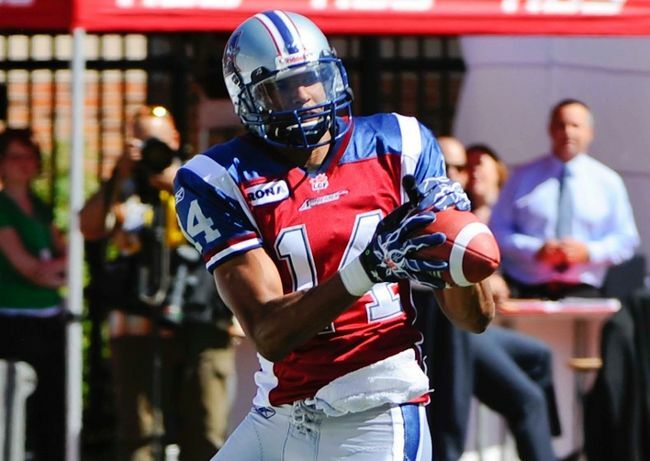 Brandon London led the Larks with five catches for 102 yards and a TD in their loss to the Argos. Several sources indicate UMass has offered to Chris Thompson, a 6-0 165 pound WR from Gainsville, FL. Why UMass is interested: ran a 49.60 400-meters. Thompson has offers from Florida Atlantic, Marshall and Utah. but you can have fun if you've a mind to! Bison courtesy of Custer State Park yesterday. And that's the end of our ramble through the Canadian Rockies and the Dakotas. Time to head head home. Matty V has a story on eleven former UMass players either hoping to make or improve their standing with an NFL team. Harry Plumber of MassLive looks at the Minutemen's presence in NCAA13 as another sign of arrival. An Examiner writer thinks the shine will wear off for UMass . Lost lettermen thinks UMass is the second worst team in all of FBS. Two BCS teams UMass will play in the future: Penn State and Wisconsin, are trying to turn their annual meeting into a trophy game. Mentions UMass. Boston.com has a Patriots training camp article that mentions James Ihedigbo. SB Nation reports former UMass DT Theo Agnew is transferring to Georgia State. The Daily Press looks at the geographic troubles of Maine and UNH football. With a $400,000 travel deficit, the Black Bears will probably have to add a second FBS OOC team to their annual schedule or take some other action to reduce costs. The CAA adding Albany and Stony Brook would be a big step in the right direction. Victor Cruz reported to the Giants camp with a big smile. The Giants Blog (good name) says Cruz is a household name. Newsday says he's back where it all began. The MAC Blog "Hustle Belt" looks at the 2012 MAC linebackers position. The Daily Chronicle breaks down the MAC ballot. James Ihedigbo made a nice play during the Pats first day of training camp. Illinois sent eight assistant coaches to the Penn State campus. UConn is making a bid. SB Nation keeps an eye on the situation here. One thing to note that I think has not been mentioned much is that the players have until 2013 to transfer. The recruiting games for Nittiany Lion players will probably continue for some time. Good Morning from Rapid City, South Dakota. MassLive's Harry Plumber has extensive notes from the MAC Media Day. The Morning Sun says the MAC is making strides as a conference. FB Scheduling says UMass will host Maine in 2013. Then back to the salt mines for 2014. Wisconsin announces the Badgers 2013 schedule. In the comments, Wisconsin fans don't know UMass is now FBS. MAC Blog "Hustle Belt" continues its series on "Getting to Know UMass" and has a post on the best Minutemen defensive players since 1990. Worth a read. 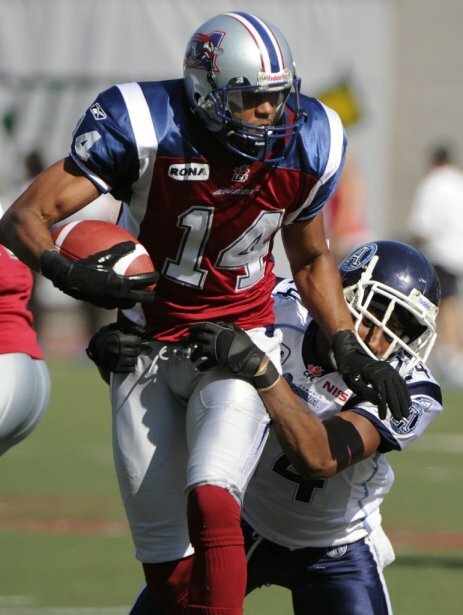 They also look at MAC secondaries for 2012. ESPN chronicles Victor Cruz's wild ride. "Out of the Blue" is #3 in Amazon sales in the "Sports" section (scroll to product details). Is building bridges as a player and his career. Part of the Larks "Big Boy" football. Good Morning from Moose Jaw, Saskatchewan. Ever since I was a kid I wanted to see what Moose Jaw looked like. Matty V has UMass' best shots at All-MAC in 2012. I'd include Nick Speller. Fox Sports Ohio says to look forward to more wild offense in the MAC. MassLive has an article on UMass' participation in the MAC's Media Day. The Toledo Blade looks at MAC newcomer UMass' schedule. MassLive has Coach Molnar's take on the 2012 rule changes. The UMass Daily Collegian has Coach Molnar's comments on the Media Day and the Minutemen's QB situation. The New York Times says the rush is on for Penn State players and mentions UMass. Interesting that the NCAA ruling specifically made Penn State's players free agents. I would speculate that the NCAA was not sure that it's other sanctions would make an impact on the Nittany Lion juggernaut. SB Nation has an on-going series of updates on the Penn State free-agent thing. One Nittany Lion player has already decided to leave. The NJ Daily Record has a long story on former UMass LS Travis Tripucka's bid to make the LA Rams roster. The MAC Blog "Hustle Belt" looks at the return game for each league team and ranks UMass last. The MAC Daily says UMass' season is already a success. Yes it is. We're finally where we should be. Phil Steele, always looking for new ways to chop data, looks at if All-conference player teams can predict league success. UMass does not finish last in the MAC East in this scenario. More on the ins-and-outs of possible transfers from Penn State. The NCAA will allow other schools to exceed their normal number of scholarships. Coach Molnar will assess the situation. UMass aims for the high road. MassLive looks at the possibility of Penn State transfers. SB Nation thinks New England schools will be keeping track of the situation. Perhaps not as many Penn State players will leave as various football scribes expect. Coach Molnar and his staff have been energetic since their arrival, so I would think the Minutemen would be in play for a least some of the players who want to leave. The NCAA's changing the 85-scholarship rule will tend to favor BCS teams. UMass does have playing time to offer, though. Possibly the most impact will be on Penn State's recruiting. Recruits haven't spent any of their eligibility yet, so it would seem they would have the most options. They would also have the least incentive to jump into the situation. The following is a cut-and paste from Matty's original article. Links added by me. UMass was interested in a couple of the recruits. Today is MAC Media day on ESPN3. UMass was picked last in the MAC East. The MAC Championship Game will remain at Ford Field through 2015. MAC Conference officials react to the Penn State train wreck. Phil Steele looks at who will win the non-AQ conferences. The Minutemen come in last in that poll also. Good Morning from Lake Waskesiu, Saskatchewan . That's in Prince Albert National Park. 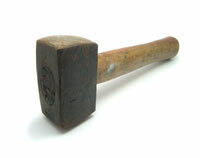 As your have undoubtedly heard by now, the NCAA is dropping the hammer on Penn State. Matty V has a story about the possibility of UMass snagging some transfers from the Nitiany Lions. The following is a cut-and-past from Matty's article with the links added by me. The MAC blog "Hustle Belt" ranks MAC punters. Jeff Strait ends up #12. The UConn blog plays the 2012 season on NCAA13 including the opener against the Minutemen. The MAC Blog "Hustle Belt" has a table on all the MAC players listed on the various preseason award lists. Not surprising for a first year FBS team, UMass has zero entries. Brandon London had four catches for 88 yards in the Larks loss to Hamilton. Victor Cruz vows not to let celebrity go to his head. Cruz got a big turnout for his book event. ESPN has a blog post on WMass players in the "Super 7" camp in Wilbraham. UMass' June verbal Sha’ki Holines received an offer from UConn and interest from Maine. I've Blogged about Holines twice before. Good Morning from Drumheller, Alberta. It seems to be light football news day on the intertubes. Sports Chat Place looks at the 2012 Minutemen------ and uses one of my old images in the process. This year's OOC opponent Michigan has only a minor memory of Tom Brady. A Bleacher Report writer doesn't think Jeremy Horne will make the Chiefs roster this year. Rant Sports has a fantasy football video on Victor Cruz. The Attleboro Sun and the Enterprise say UMass tickets go on sale to the general puiblic on July 16th. The Eagles roster from A to Z (including Emil Igwenagu). Inside the Eagles looks at the position battles going into camp. Opposing Views looks at how the H-back position has changed. UConn will be without the services of their star recruit Casey Cochran for the UMass game. Note at the end of the article it says the UMass-UConn game slated for August 30th will be televised on SNY. Sports Chat Place looks at Indiana Football for 2012. A Giants coach told Victor Cruz to start salsa dancing. Matty V. has an article on former UMass kicker Jason Cherry's role in the new Batman flick "The Dark Knight Rises." Remember I did a blog post on this back in April. The Bleacher Report has a post on the upcoming MAC Media Day. The MAC Blog "Hustle Belt" reacts to yesterday's post about a fictional college draft. UMass would get USC's Matt Barkley. Vladimir Ducasse joined Mark Sanchez's "Jets west" camp. Yet another commentary on the Pats safeties, including James Ihedigbo. More on Victor Cruz's book release here and here. Rant Sports says the Giants should sign Cruz before Linsanity kicks in. Victor has been thinking about who should play his girlfriend in a possible movie about his life. The Kansas City Star looks at the rule changes in college football for 2012. MassLive has a nice story about UMass football players and a service learning class in Holyoke. Coach Molnar has said he wanted UMass football to be a positive force in the community. Looks like he's made a start. SB Nation has a long post about "What is your program worth?" The Minutemen come in at #100. Sports Illustrated does a mock draft for college football teams. The Minutemen, as a new and low rated FBS team get the #3 pick. The post has a positive mention of Coach Molnar. A Bleacher Report writer looks at the Patriots "bubble players" including James Ihedigbo and the other safeties. Philly.com looks at the Eagles position battles going into summer camp. It includes Emil Igwenagu at fullback. PhiladelphiaEagles.com also looks at the status of the Eagles running backs/full backs. Giants 101.com has an informative post about Julian Talley looking to stand out in training camp. FanIQ looks at the MAC and predicts the Minutemen to go 0-12. The MAC blog "Hustle Belt" says a MAC player will never win the Heisman and that's OK.
A missed tackle on Brandon London had a big impact on outcome of a recent Stamps-Larks game. In his new book "Out of the Blue", Victor Cruz has a positive message for teenagers. ESPN Boston has a post on Catholic Memorial's Peter Ngobidi verbaling to UMass. Ngobidi is reported to have a 34-inch vertical and has a 4.61 40. I thought this page was interesting. It shows the Rivals "Top 10" recruits for Massachusetts in 2013. Note that UMass has signed two of the top eight. The ninth and tenth players listed have only mid-major FCS offers. The Detroit Sports Site says the last Michigan-UMass game was way more interesting than it should have been. The Sports Chat Place thinks the UMass game will be one of the few where Akron is favored to win. Western Michigan takes in $1.2 to $1.5 million in guarantees from BCS games. With four BCS games this year UMass should top that even with the reduced amounts we will be paid as a "transitional" FBS team. As I always do, I will point out guarantee money is real spendable cash, not accounting dollars. Big Red Today looks at the Big Ten's OOC schedule including MAC teams UMass and FCS UNH. The Giants Football Blog (good name) says Victor Cruz came out of the blue and soon will move into the green. XO Fan has a post about Peter Ngobidi's commitment to the Minutemen. Hudson Report has another mention of Shane Huber verbaling to UMass. My previous posts on Huber. A Bleacher Report writer picks UMass over Indiana. isportsweb has a look at the Hoosiers' 2012 schedule. Phil Steele has a post on first year coach's records. A better look at OOC opponent Vanderbilt's new uniforms. Vandy blog "Anchor of Gold" has more on the uniforms. Mlive.com looks at the MAC conference football priority plans. Multiple media outlets are reporting that Peter Ngobidi, a 6-2 220-pound LB/DE from Catholic Memorial has verbaled to UMass. Post from ESPN Boston here. My orginal blog post about Ngobidi from back in March. SB Nation reports that Jarrad Alwan, a 6-3 230-pound LB from Cherry Hill, NJ committed to Temple. Alwan verbaled to the Owls over offers from UMass, Boston College and West Virginia. Good Morning from Canmore, Alberta. The wireless that comes with our rental is not working, so I'm working through several tenuous links from public wireless. This may impact the blog for a while if I can't get the private wireless up. A Bleacher Report writer looks at the history of Georgia Southern including the 1998 game against "a UMass team that got a few lucky breaks along the way". 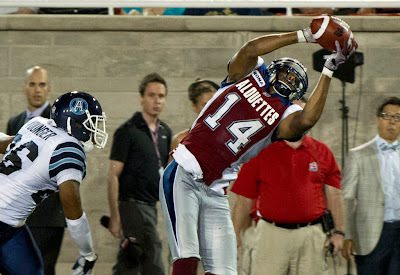 Brandon London's 36-yard catch set up the Larks game winning TD reception on the next play in the Alouettes comeback win over the Stampeders. Victor Cruz received a lot of trash talk from NFL corners in his rookie year. Cruz said it's his job to play football no matter what the status of his contract is. The NY Post says Cruz will arrive at camp this year as an established star. Individual game tickets for 2012 will go on sale next Monday. The first two games are probably the most interesting, but UMass' chances of winning are probably highest in the last two. SB Nation ran a simulated 2012 season in NCAA13 and got UMass going 0-11. I don't think so. Athlon Sports looks at offensive lines for every team in FBS for 2012. IMHO, for the Minutemen, the OL is probably the most FBS-ready unit on the team. Three fifth-year seniors and one junior are almost as good as it gets for a offensive line coach. If your should walk into a draft room for any NFL club and asked about Minutemen prospects for the 2013 NFL contract, it would probably go something like this. Phil Steele looks at who will have the most improved offense/defense this year. Brandon London led the Alouettes in receptions and receiving yards in their last minute win over the Stamps last night. Mrs Blog and I took a tour to Athabasca Glacier and our tour van driver asked where we were staying. We told him we were staying at Pyramid Lake in Jasper. He asked if we noticed the jogging path near the lake. We said we did. The tour guide said "My daughter was jogging with her dog on that path in May and she met a pack of wolves and the wolves ate the dog." 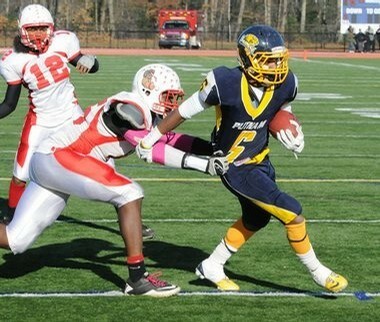 Nj.com has a story about 6-5 OT Jordan Page's commitment to the Minutemen. My previous blog post on Page. 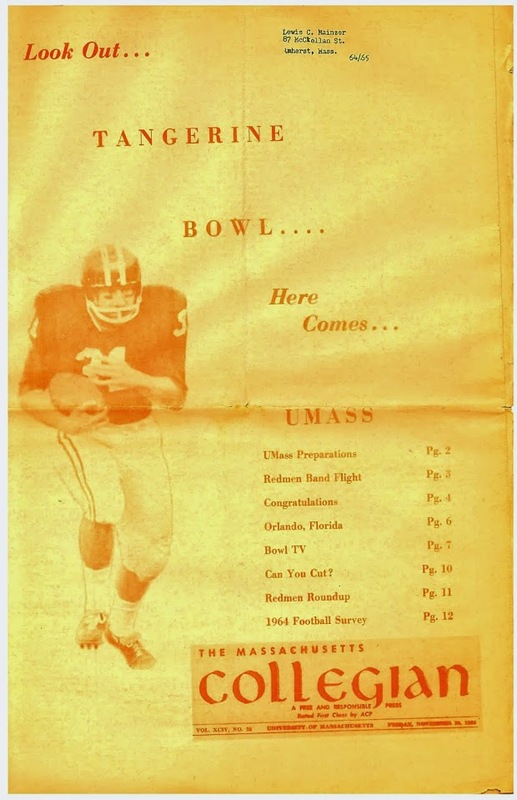 BTW, Tuesday's blog post was the 4,000th entry in the history of the UMass Football Blog. The MAC's 2012 Media Day will be carried live on ESPN3 on July 24th. Attending with Coach Molnar will be seniors Quinton Sales and Darren Thellen. The MAC blog "Hustle Belt" has a post on MAC team and player ratings in NCAA13. Opposing Views.com has a preview of this year's OOC opponent Vanderbilt. Vandy also will have new uniforms for 2012.It'll be an all-white helmet game if UMass retains white helmets in its rumored uniform redesign. It's a big Vanderbilt news day as they will also have new turf this year. A bleacher Report writer has a post on last-years's-stars-who-must-repeat including Victor Cruz. James Ihedigbo is among Patriots safeties to watch according to the Boston Herald. Tickets for UMass' away games are available through the UMass Ticket office. 8/30 @ UConn: $35 per ticket. Sections 134-137 and 237-238. 9/22 @ Miami (OH): $20 per ticket. 10//6 @ Western Michigan: $20 per ticket. 10/27 @ Vanderbilt: $35 per ticket. Section V.
11/3 @ Northern Illinois: $24 per ticket. 11/10 @ Akron: $20 per ticket. Tickets and hospitality packages for the September 15 game at Michigan are available through Worldtek Travel. Click here or call Worldtek at 1-800-879-6176 for more information. All other games can be purchased by calling the Athletic Ticket Office at 413-545-0810. Please note that a $5 per game service charge will be applied to all orders. Please order by August 1 in order to be seated based on your Minutemen Club donor level. Michigan announces ticket plan for UMass. Sports Bank.net previews our OOC opener UConn. The MAC blog "Hustle Belt" has a post on four MAC players making preseason national watch lists. The College Football bowl schedule for 2012-13 was announced yesterday. A post from XOfan about Shane Huber's verbal to the Minutemen. Huber enjoyed the campus tour put on by UMass graduate assistant Ryan Gold. 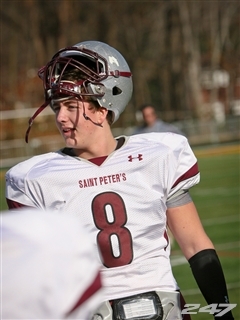 Matty V reports that UMass has received its second three star verbal when Shane Huber committed to the Minutemen. I've blogged about Huber before. Huber will also be the second 2013 recruit to express interest in my old school, the Isenberg School of Management. ESPN has already updated their UMass commitments page showing Huber's verbal. MassLive.com also has a post about Huber. Huber had offers from Navy, Temple and UCF. Good Morning from Jasper, Alberta. MassLive.com Harry Plumer looks at UMass' gameday at Gillette. BTW, the Patriots just announced Gillette is going smoke free. A B;eacher Report writer wonders if the MAC could get a connection with the Fiesta Bowl. The MAC blog "Hustle Belt" wonders what if Cam Newton had played for Akron. UMass' FBS opener UConn has two players named to preseason award lists. I don't know is if it means anything, but Virginia Tech transfer Jerome Lewis is no longer on the Spring Roster. The Washington times looks at five teams that might be bowl eligible in 2012. It mentions two MAC teams. Time Warner Cable is covering Victor Cruz's book event. College Football teams are getting a record number of early commits this year. It's out of control up here. Comment by XO Fan on UMass football recruiting. Jerry Hinnen of CBS Sports says Vanderbilt over UMass is a lock. A Bleacher report writer looks at Vanderbilt's chances in the SEC East this year. Phil Steele's lastest prediction has three MAC teams in bowls for 2012. Nepatriotsdraft.com describes James Ihedigbo as a "Jets castoff". A group is trying to raise funds for an upgrade to the UMass Softball stadium and is also pushing to get the facility named for Coach Sortino. Info here. New York Sports writers.com has a story about UMass commit Steve Casali. It includes some of his junior stats. My previous posts about Casali here. The Inquirer and Mirror has a story about the verbal of Terrel Correia to UMass. One thing about vacationing in Canada, I don't have to search for Canadian football. Mrs. Blog and I watched Brandon London and the Larks defeat the Blue Bombers 41-30 while eating pizza at a local restaurant. London had three catches for 24 yards. UConn has the fewest verbals in the Big East. More on the status of UConn football. A economic paper says football wins increase a school's donations, applications, academic reputation, in-state enrollment and SAT scores. If UMass can build a winning FBS program, I believe it will help tremendously with state funding and support for all the programs at the University. Victor Cruz will have a book event in Queens this month. Amazon has a prerelease order for "Out of the Blue" here. "Pats Pulpit" looks at the Patriots safeties including James Ihedigbo. Matty V. reports (see previous post for link) that Tyshon Henderson, a 6-6 300-pound OT from Middletown, RI has committed to UMass. Henderson is #1 in the above video. 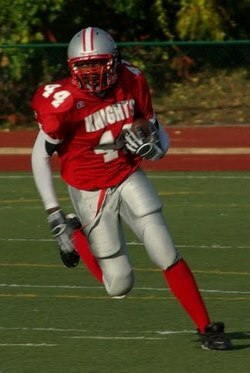 He drew interest from UConn, Rutgers and Boston College. Several media outlets are reporting UMass has picked up a verbal from D.J. Woods, a 5-10 160-pound WR from Ft. Lauderdale, FL. Woods is a Rivals two-star player. Woods had multiple offers from BCS schools. Kentucky, Indiana, Toledo and Tulane offered as well as several FCS schools. Good Morning from Calgary, Alberta. Following a link from the Boston College blog "BC Interruption" there is a site that attempts to quantify home field advantage for college football teams. Read the fine print on how they arrived at the numbers. NJ.com has a question-and-answer session with Julian Talley. A Bleacher Report writer discusses a fantasy football draft of Victor Cruz. ESPN has James Ihedigbo on their "bubble list". Although the Patriots did re-sign Ihedigbo late last month. Brandon London and Brandon Collier have been jawing at each other on social media. A Bleacher Report writer comments on Jeremy Horne's chances of remaining with the Chiefs. NBC Connecticut says UConn's trip to the Fiesta Bowl may have been the worst BCS Big East moment ----- ever. Good Morning from Lethbridge, Alberta. Not much UMass news on the Innertubes this morning. Looks like all the sports writers took the 4th off. Ron Chimelis looks at UMass' move to Gillette. Saturday Blitz notes that UMass leaving FCS became official on July 1st. Phil Stteele has the number of starts lost to injury in 2011, but UMass' numbers don't add up. A Bleacher Report writer lists Michigan's five easiest games. North Jersey.com has an article on the recent verbal of Sam Zeff to UMass. I've blogged about Zeff before. 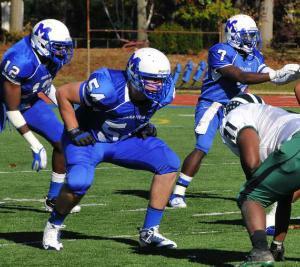 Long Island NewsDay has an article on Steve Casali's recent verbal to the Minutemen. Hope everybody has a safe and happy 4th of July! Out on the high plains of the Dakotas, USA is lookin' good. So is UMass football. We need to pay our dues for a couple of years, but I think the future is bright! MassLive's Harry Plumber has another story about the recent UMass fundraising record. ESPN has updated its UMass recruiting page to include all but one of the eight verbals UMass has accumulated so far. The Detroit Free Press ranks Michigan's schedule. ESPN reviews Chip Kelly's staff at Oregon including former UMass assistant coach Jerry Azzinaro. The Giants Football Blog wonders if there will be a drop off in the Eli Manning-to-Victor Cruz combo this year. Another review of Vanderbilt, this time by Rant Sports. ESPN Boston has revealed UMass received its seventh verbal for 2013 when Terrel Correia, a 6-7 275 pd OL from Nantucket committed to UMass. 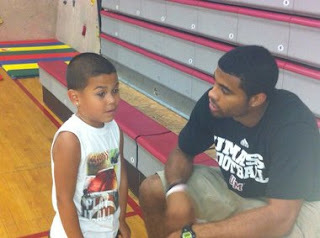 The UMass website has an article on the success of the Minutemen fund raising effort. The Minutemen Club is up to 2,569 members and the athletic dept raised $3.2 million for UMass sports. Matty V also mentions the story here. UMass Associate AD Rocco DeLuca pointed to the football upgrade as the jumpstart for the increase. During our trip an Ohio State fan knew we had moved to the MAC when he saw my "UMass Football" and Minuteman Club stickers on my truck. We didn't really chat because it was like 103 Degrees that day, but people have noticed. Opposing Views.com previews UMass OOC opponent Indiana. Examiner.com predicts Indiana to go 4-8 and Michigan to go 10-4, both with wins over UMass. Football Scoop says Liam Coan is leaving URI and returning to Brown to coach quarterbacks (scroll to the end of the July 3rd post). Phil Steele looks at the breakdown between upperclassmen and freshmen and sophomores for every FBS team including UMass.